The Twin Cities Social Justice Education Fair exists to bring together educators, students, parents, and communities from across the Twin Cities Metro to collaborate, network, and organize social justice in education. 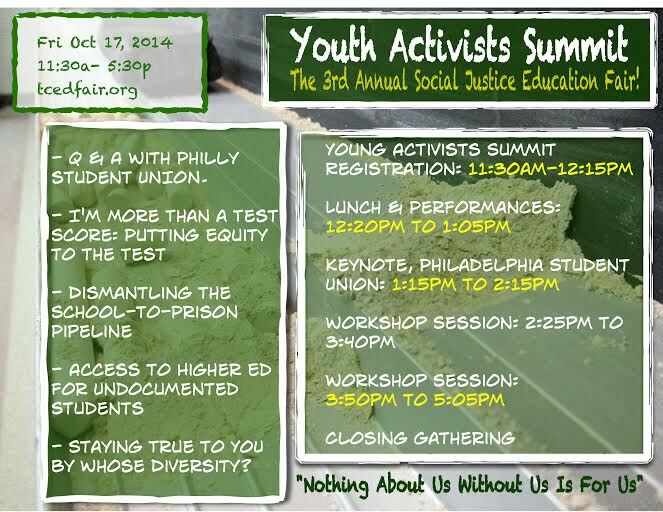 The Youth Activist Summit is about creating space at the 3rd Annual TC Social Justice Education Fair for youth to speak their truth, to learn from their peers from Philly and the Twin Cities, and to gain skills in order to build power to transform their schools. It will include free Youth Activists Summit t-shirts, lunch, a keynote presentation by Philadelphia Student Union, two workshop sessions, and art and networking spaces. The Fair is entirely FREE.